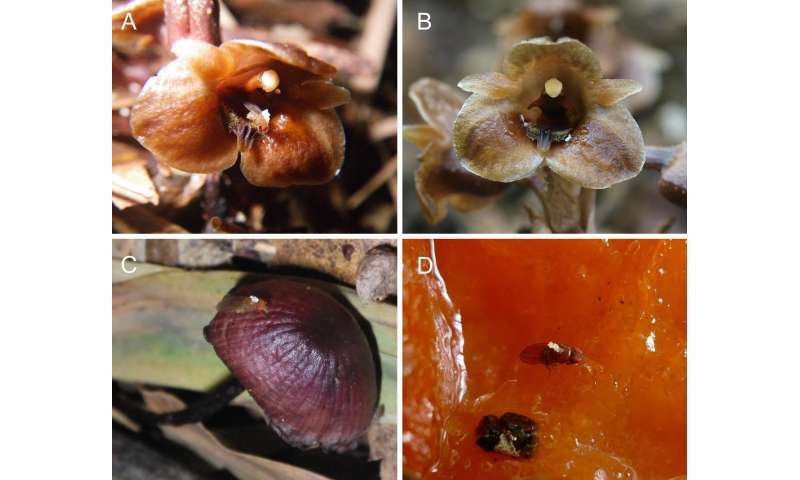 The non-photosynthesizing orchid species Gastrodia pubilabiata smells like rotting mushrooms or fermented fruit, and is pollinated by fruit flies who mistakenly lay their eggs in its flowers. If there are rotting mushrooms near the orchid, its pollination rate increases. 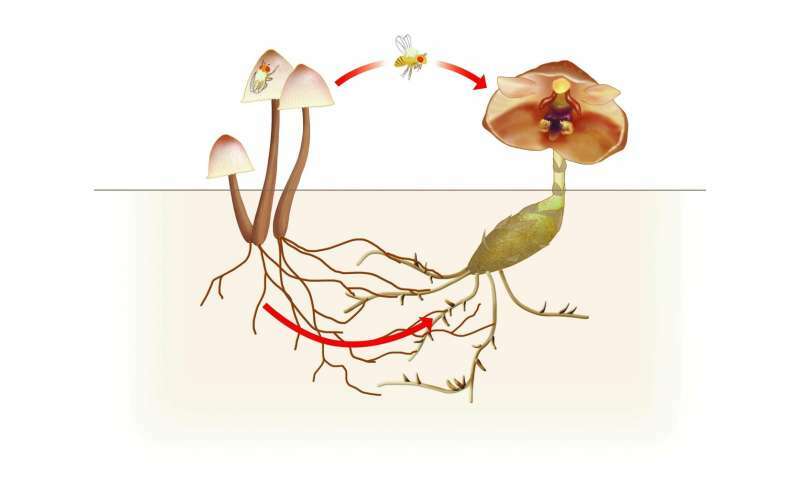 As well as using mushrooms to attract insect pollinators, G. pubilabiata survives by absorbing nutrients from the fungal hyphae of mushrooms. This is the first time a plant has been discovered to depend on mushrooms both above and below ground. The research findings by Project Associate Professor SUETSUGU Kenji at the Kobe University Graduate School of Science were published in Ecology on March 23. Over 90 percent of flowering plants use animals to help them pollinate. In most cases, the animals are rewarded with pollen or honey—it's a win-win situation. However, some plants trick insects into bringing them pollen without providing any compensation. G. pubilabiata, by emitting a smell of fermented fruit and rotting mushrooms, advertises itself as a good brood site for fruit flies. The fruit flies pollinate the plant by laying eggs there and visiting their brood. However, G. pubilabiata does not have anything the young fruit flies can eat, so they die soon after hatching. When such plants disguise themselves by mimicking other species in close proximity, insects may mistakenly visit the imitator of the plant. Professor Suetsugu compared the reproductive success rate of G. pubilabiata with and without rotting mushrooms nearby. The results showed that with rotting mushrooms beside it, the pollination rate for G. pubilabiata rose significantly. G. pubilabiata has another interesting trait—instead of engaging in photosynthesis, it lives on nutrients from fungal hyphae of the mushrooms. In other words, this plant survives on nutrients taken underground from mushrooms, and also uses mushrooms to attract pollinating insects. This is the first time a plant has been observed to rely on mushrooms both above and below ground. Plants that have abandoned photosynthesis can survive in environments without sunlight, giving them an advantage over potential competitors. However, in these environments, they probably cannot rely on typical pollinators such as bees and butterflies for pollination, because both bees and butterflies prefer areas of high light intensity. In order to take nutrients from mushrooms, they live on the dark forest floor. Therefore, their lifestyle inhabiting the dark understory may influence the pollination biology of these achlorophyllous plants. Fruit flies also use rotten fruit as brood sites, so G. pubilabiata could potentially increase their reproductive rate in the vicinity of fermentedfruit. Professor Suetsugu will continue these surveys to shed light on the changes that take place when plants abandon photosynthesis.